On Friday afternoon, Bellator CEO Bjorn Rebney announced the organization has inked light heavyweight Renato “Babalu” Sobral (Pictured) to a multi-fight contract. Babalu will enter the organization’s 205-pound tournament in January. The former Strikeforce light heavyweight champion owns an extensive 37-9 professional record. He has alternated between wins and losses over his past five scraps. 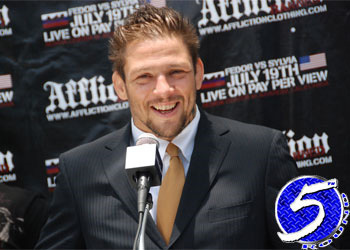 The 36-year-old was last seen submitting Tatsuya Mizuno at “ONE Fighting Championship: Destiny of Warriors” in June. Perhaps the highlight of his 15-year career, even though it came in a TKO defeat, was in August of 2006 when he challenged then-champ Chuck Liddell for his crown at UFC 62.